Our tankless water heaters provide instant hot water on demand for homeowners in Missouri. We carry some of the top rated, energy efficient tankless water heaters on the market for our customers. Our tankless water heaters experts also provide reliable repairs and maintenance services to ensure your tankless water heating system continues to provide you with an endless stream of hot water when you need it. While traditional electric and gas water heaters are the primary source for supplying hot water to homes, tankless water heaters are continuing to increase in popularity with homeowners due to the energy efficiency and reliability these water heating systems provide. 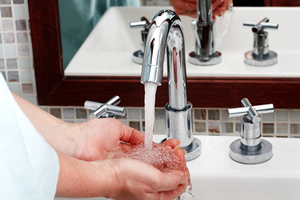 Our tankless water heaters use propane or natural gas to heat water – only when needed. This saves homeowners a lot in energy costs! Unlike conventional storage tank water heaters that are constantly in operation, our tankless water heaters that only head on demand are the optimum choice in today’s world of high energy costs and environmental preservation. Our tankless water heaters tend to help customers save up to 40% on their energy costs. Now that’s savings you can see! Your tankless water heater will end up paying for itself in a short amount of time with those type of savings, so it makes for an excellent investment. Why? Because we don’t make our customers wait around all day for our plumbers to show up to take care of their hot water heater installation and repair needs! It’s that simple. We arrive ON TIME for all appointments, ensuring our customers receive reliable service when scheduled. Our plumbers are dedicated to providing top quality water heater repair, installation and maintenance services regardless if you have a tankless water heater, gas water heater, electric water heater, traditional tank water heater or some other form of water heating system such as solar water heaters. Give our plumbers a call today to discuss your hot water heater needs.